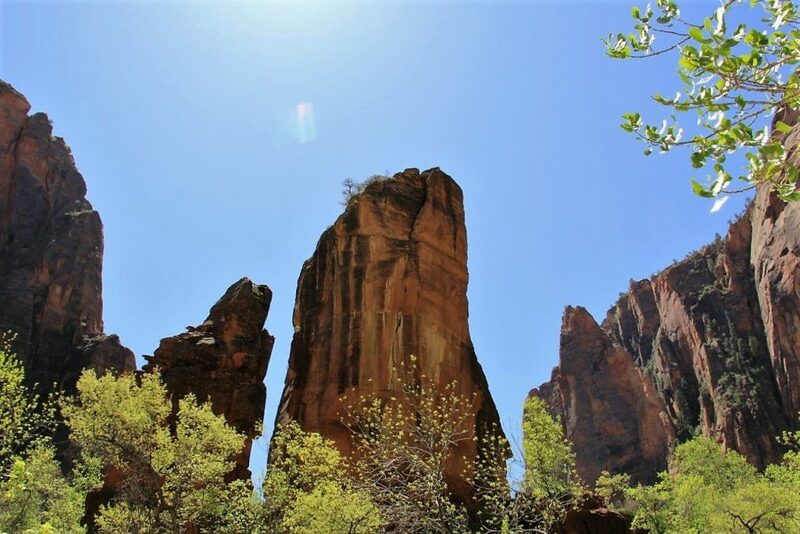 When you combine the geologic setting with the unique climate of Zion, you have the makings of an amazing national park. 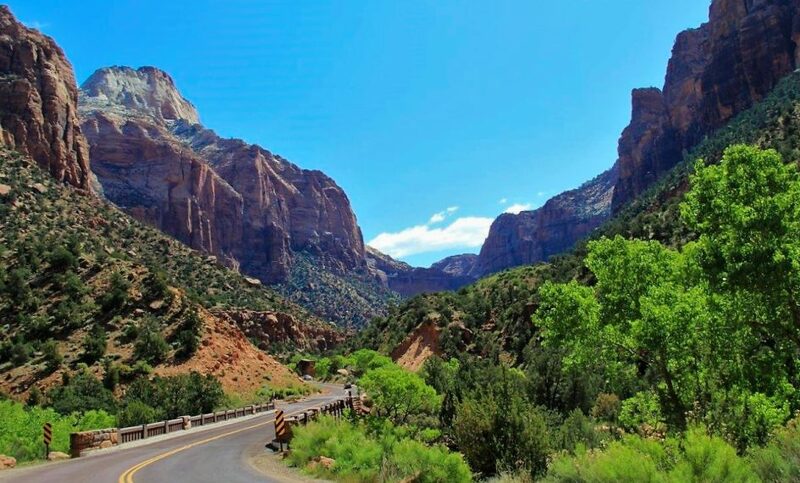 To top it off, you are between 1 and 3 hours of several other amazing parks including Bryce Canyon, Arches, Canyonlands, Capitol Reef, and of course the Grand Canyon. This area of America is what I like to call the geologist’s Disneyland! 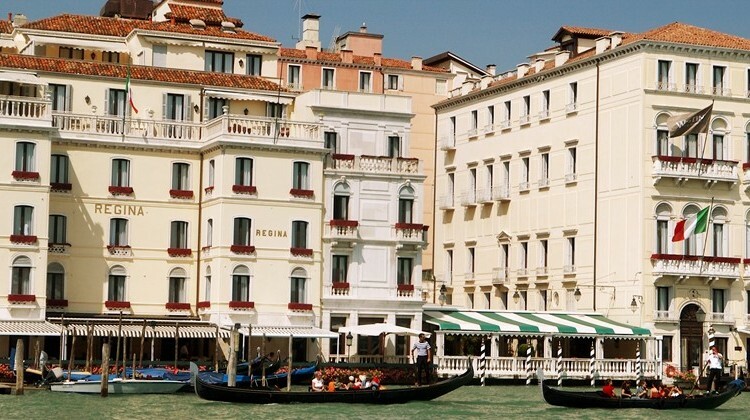 Read on to see what to do in this stunning park. 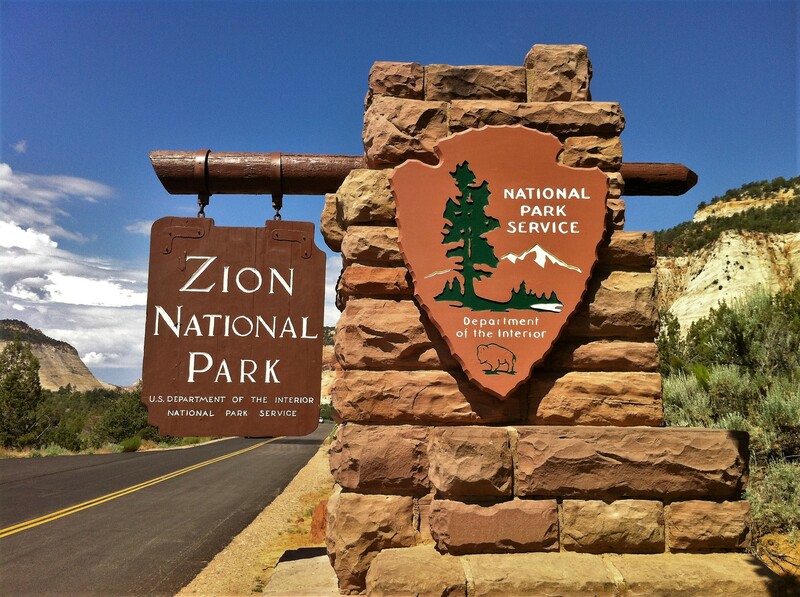 In 1997, due to overwhelming popularity of Zion Canyon, the NPS closed the road through the canyon to most private vehicle traffic. 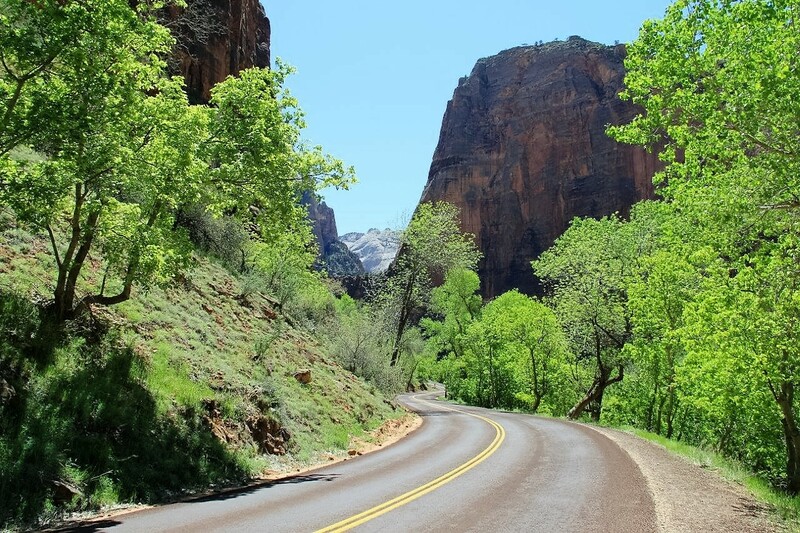 Unless you’re staying at Zion Lodge within the canyon, you won’t be allowed to drive the canyon. There are rumors of this happening soon too at Yosemite National Park, and if you’ve been there in July and August, you know why. The Zion Canyon Shuttle is very convenient with a bus every 15 minutes or less. The round trip from the visitor’s center is just under an hour and a half. There are 8 stops in the canyon with hiking and dining options throughout. If you want to go more at your own pace, you can walk or bicycle the entire canyon on your own, or pick up the shuttle if you’ve had enough. 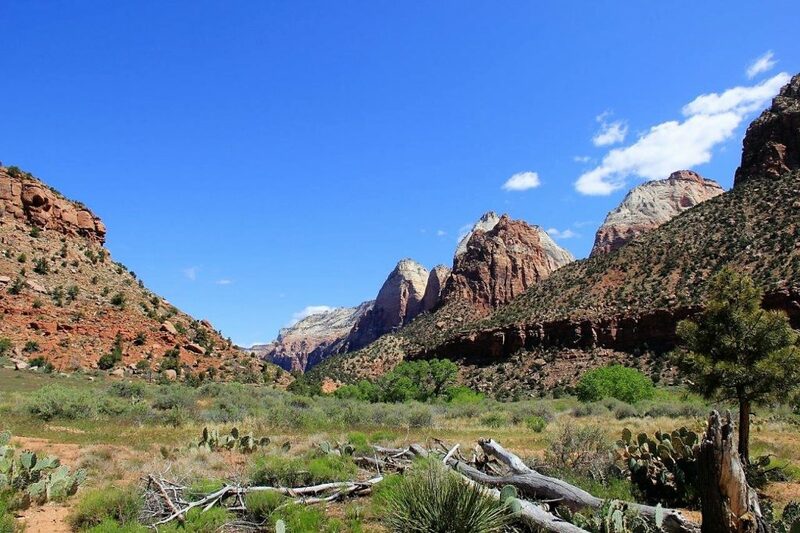 As in all of our national parks, there is a ton of great hiking in Zion National Park. 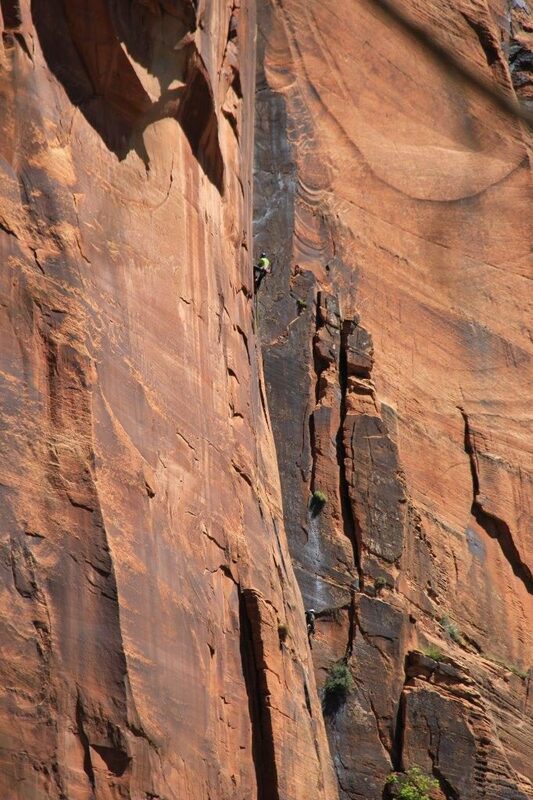 Whether you like low and slow or steep, goosebump-inspiring climbs, Zion has it all. 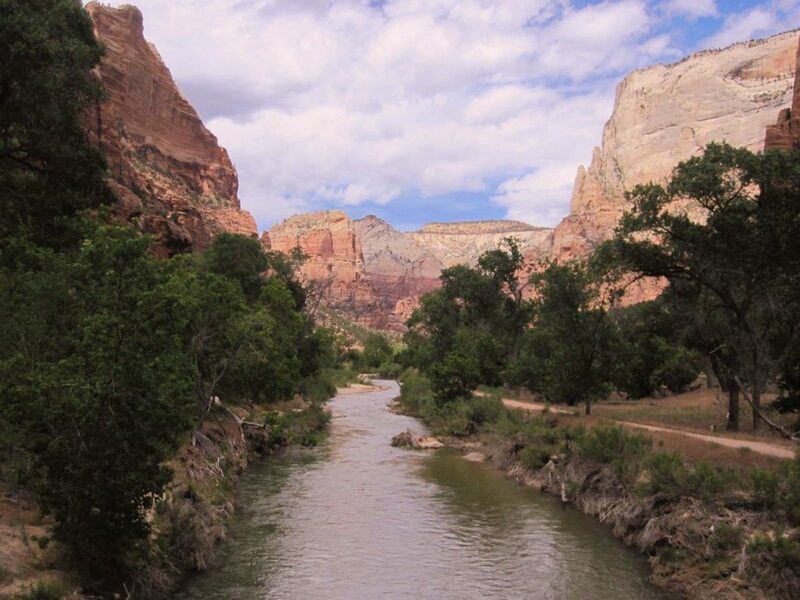 There are no less than 18 hiking trails in the canyon with a nearly equal number of easy, moderate, and difficult hikes. A hike that we took was the low and slow through the main canyon, We took the shuttle bus all the way to the end of the line, Temple of Sinawava. 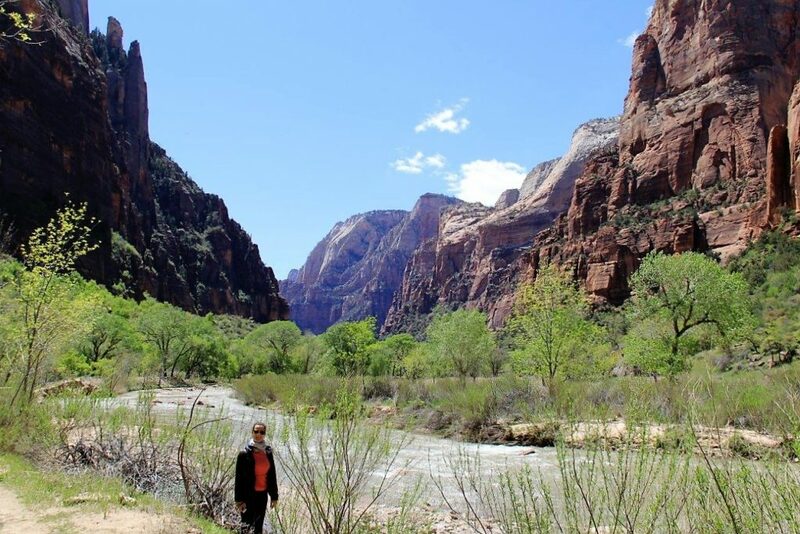 From there you have basically 2 choices, head up the Narrows and into the Subway, a well photographed slot canyon where hiking within the Virgin River is required. It was closed when we were there, owing to recent storms in the vicinity. 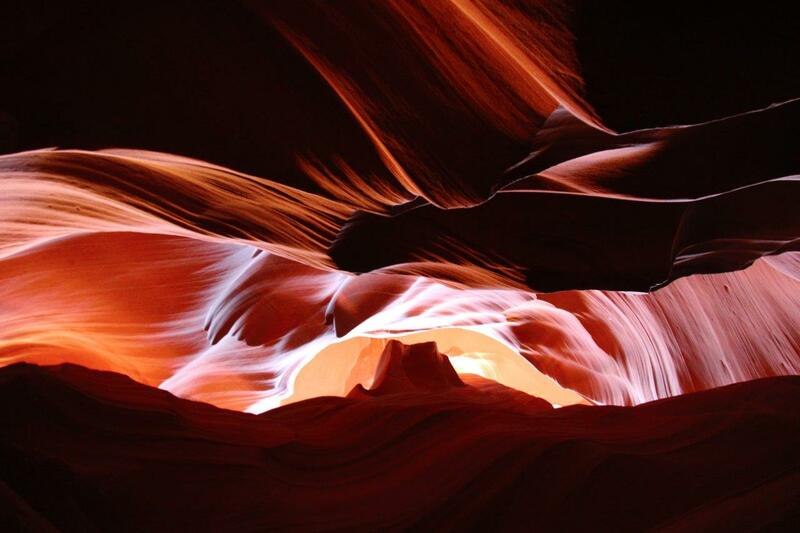 Storms and slot canyons don’t go together. Even if you’re hiking in clear blue skies, a storm farther away can send a flash flood of water and debris that can be on you in an instant. 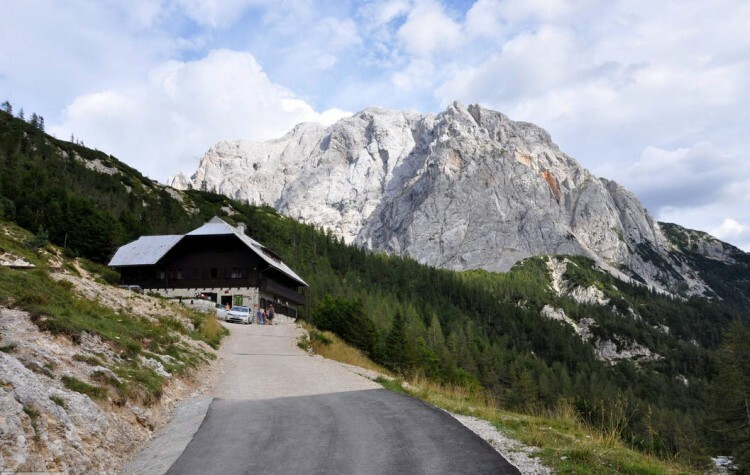 Seven seasoned hikers were killed in this canyon in September 2015 due to such an event. In the desert, hiking has many dangers, but if you’re well prepared and informed, it can be awesome! We took the easy stroll along the road and river. There’s no formal route along the river, so we ended up walking partly along the road and partly along some “social trails,” so called by a park ranger, along the river. It’s such a beautiful walk with birds, small mammals, the rushing river, hundreds of cottonwood trees, and towering sandstone cliffs to frame every photo. We also made several side trips to the Weeping Wall, the Grotto, the Emerald Pools, and the Court of the Patriarchs. All had stunning scenery and wonderful features. 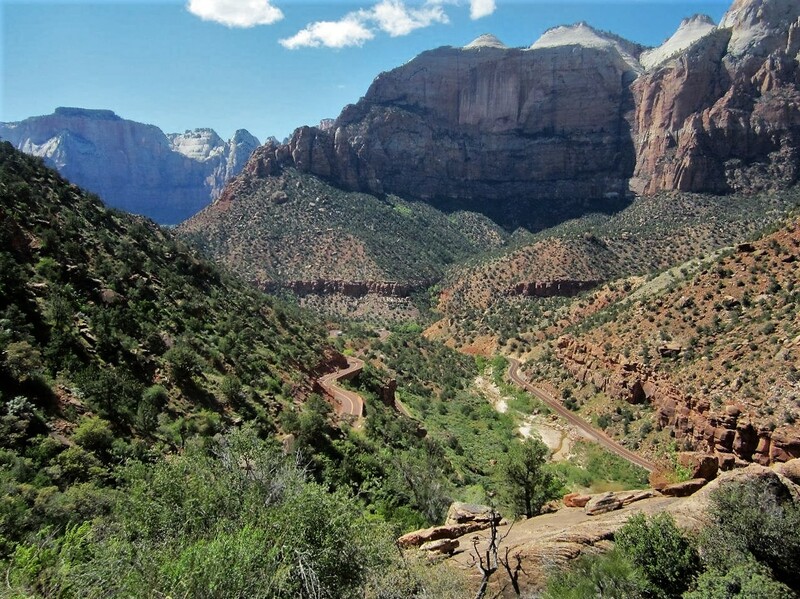 Angel’s Landing is probably the best known strenuous hike that literally takes you up the steep canyon walls to ever increasing views of Zion Canyon. When down in the canyon, you can see some of the hikers on this trail if you know where to look. Seeing them climb the staircases cut into the rock gives you an appreciation for the difficulty of the climb. 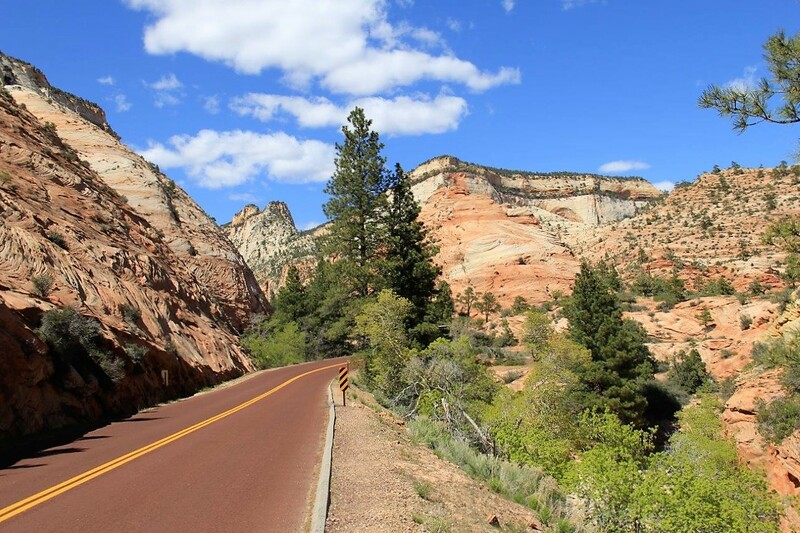 Whether your idea of a nice bike ride is a slow ride along a fairly level path or a steep heart pounding climb, Zion National Park has both of those and some in between. 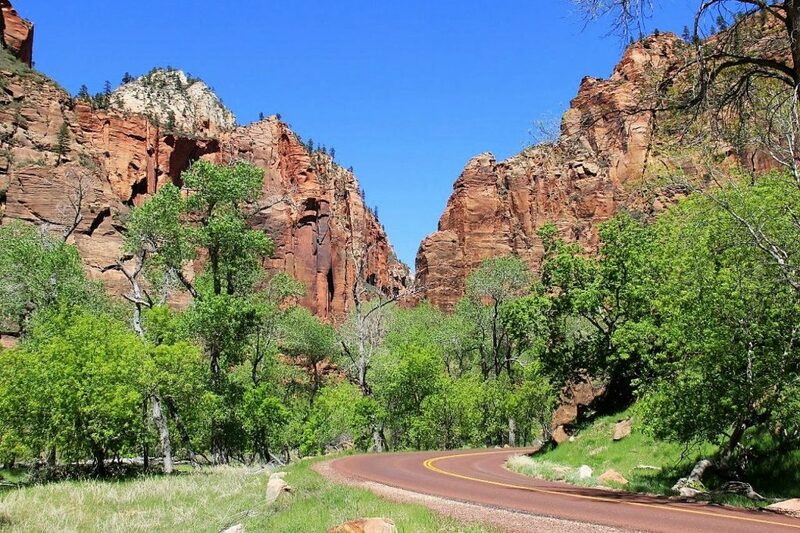 The main road into Zion Canyon, while closed to most private vehicles, does allow bicycling throughout the length of the canyon. You can schlep your bike all the way from home, or find bike rentals in the town of Springdale. If you’re looking for a more challenging ride, the Zion-Mt. 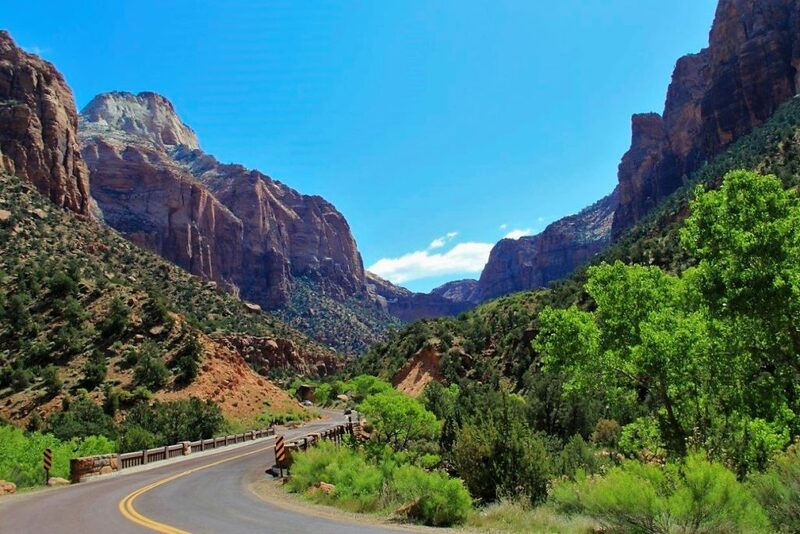 Carmel Highway will take you up and out of Zion Canyon. The multiple switchbacks are a fun ride on a motorcycle and probably even more so on a bike. Alas, if you want to head all the way out to Mt. Carmel to the east of the park, you’ll need someone to give you a ride through the tunnel as bikes are not permitted. But east of the tunnel, more scenic beauty awaits the intrepid cyclist. If strenuous hiking isn’t enough for you, there are more than a dozen climbing areas to choose from. By Big Bend and Weeping Rock, if you look closely, you can see rock climbers ascending the near vertical face of the canyon. Now those guys and girls have nerves of steel! I’ll first say that we’re unabashed fans of SPG. 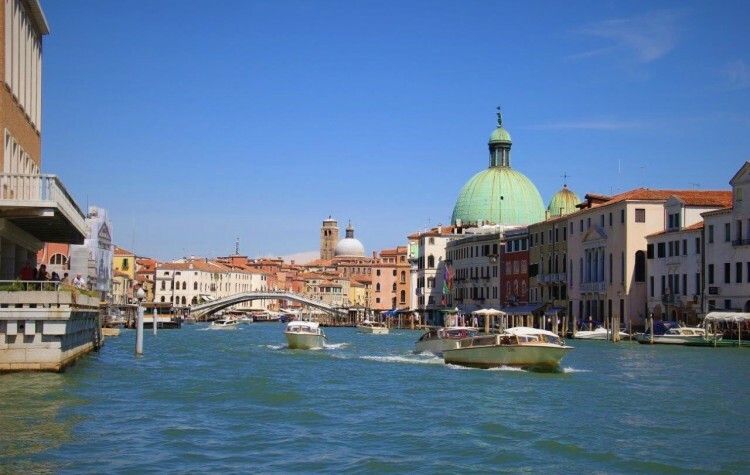 They are at the style and level of quality and service we prefer and they seem to have hotels in just the right location for the cities we visit.